Penny Arcade - Tracking a “Viral” story in real-time. Tracking a “Viral” story in real-time. It was no big secret that our web servers were struggling a bit after the Ocean Marketing post was made (we did our best to keep up with the inflow of traffic, with mixed results). But what was REALLY fascinating was that Kenneth (the guy that runs all the tech over here) and I were still awake at 12:30 AM when Mike first made his post. 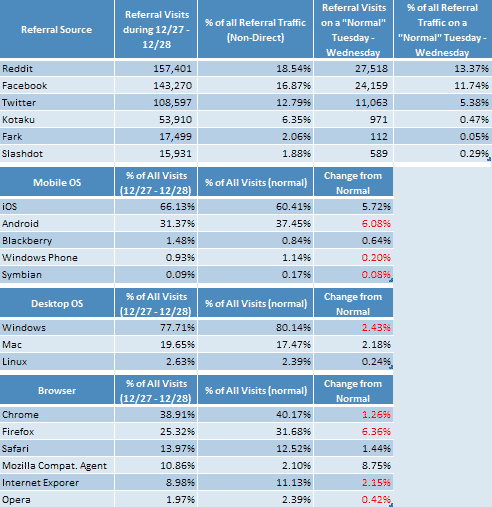 After noticing an unusual increase in traffic, we spent the next few hours soaking up all the data we could. We figured it was something few people really had the opportunity to do - to track something "going viral," in real-time. What's interesting about this data set is that it's at 1 AM PST, so there's really not a lot of additional referral traffic to muddy the results. It's pretty much Twitter, Facebook and Reddit, all of which organically feed off each other. 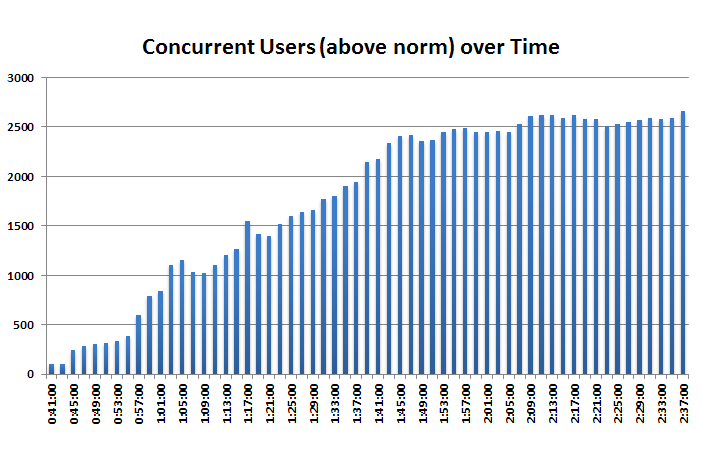 Based on historical data, I was able to strip out what our average "normal" concurrent users are, so what you see in the graphs below I consider to be "traffic that is directly attributed to people sharing this." The following graph shows this data over time, sampled every two minutes. Note: I was taking the samples using Google's Real Time Stats. For this two hour period, we experienced some major surges in traffic, but something we also started to track was our rank on Reddit. We didn't notice someone had submitted it there until 1:25 AM, so the data starts there. 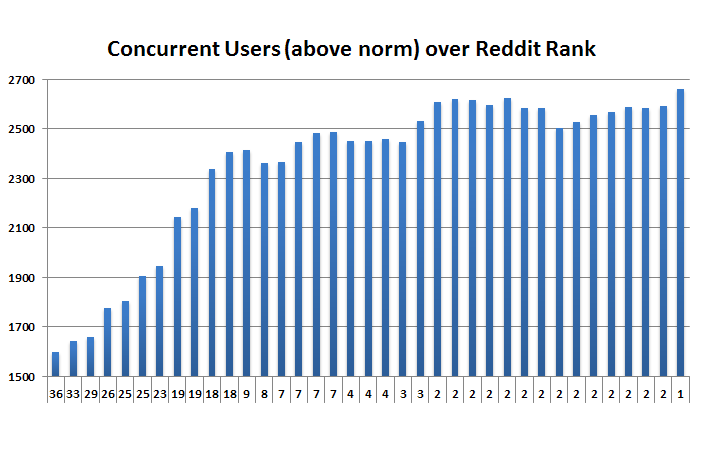 To me this is an interesting graph, but like most places, I'd imagine 1 AM isn't exactly a "peak traffic" time for Reddit, so this data really does require a specific set of circumstances. It was fascinating to see the traffic bumps when you hit 26, the front page (top 25), and then what is essentially a flat line until you hit one of the top 3 spots. I know this data isn't perfect, and there were factors other than Reddit. But I think this is as close to an isolated test environment someone can get to studying the Reddit effect. Even if it's not them directly referring traffic, I know they have a tremendous amount of influence across other platforms which ultimately drive traffic. Throughout the next 48 hours, we were able to monitor people coming in from different sources and reacting to different stories - it would honestly take me a week to compile all the data we have on it, but for some more big picture stuff, I pulled some numbers for the full 48 hour time period (Tuesday @ 12:01 AM to Wednesday @ Midnight) and compared it to an average Tue-Wed.
Who knows. Maybe this kind of stuff is strictly for the math majors out there.